The index opened flat and stayed in a narrow till RBI policy came out, which saw no change, but the index zoomed up to the highs of the day at 8031. Profit booking saw the index close flat at 7964.80, a miniscule gain of 5.90 points. The broader market though was negative, with 713 advances to 812 declines. The initial series range still remains at 7800-8200. Call option 8000-8400 added huge 17.24 lacs OI with profit booking seen at 8500 strike price. Put option 8000-7500 added huge 39.76 lacs OI with short covering seen at 8100 and above strike prices. 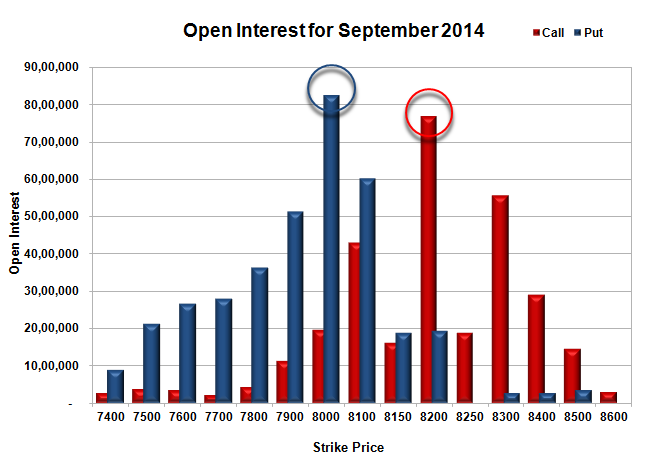 Nifty Open Interest is at 1,57,01,650 up by 1,97,800, with no change in price, probably long build-up. Bank Nifty Open Interest is at 14,79,750 down by 60,200, with decrease in price, probably long liquidation. FII’s bought 2.90 lacs Futures, which includes 8534 contracts long build-up and 2740 contracts short build-up, with increase in net OI by 11274 contracts (includes 50774 longs to 44980 shorts for the day) and the average price per contract comes to around 7965.76. FII’s Index future open contract as on date is 213404 Longs to 64091 Shorts, net long 149313 contracts. Initial and super support at 7900, with OI of 52.57 lacs and below that at 7800 with highest OI of 55.61 lacs. Initial resistance at 8100, with huge OI of 45.99 lacs and above that at 8200 with huge OI of 54.79 lacs. Day Range as per Option Table is 7899 - 8047 and as per VIX is 7910 - 8020 with 7973 as the Pivot. The index opened flat to positive and stayed in a narrow range for the better part of the day, only to dip towards the lows around 7935 in the dying minutes but moved up to close just below at 7958.90, a small loss of 9.95 points. The broader market though was positive, with 1005 advances to 536 declines. The initial series range still remains at 7800-8200. Call option 8100-8600 added huge 19.00 lacs OI with small short covering seen at 7800 strike price. 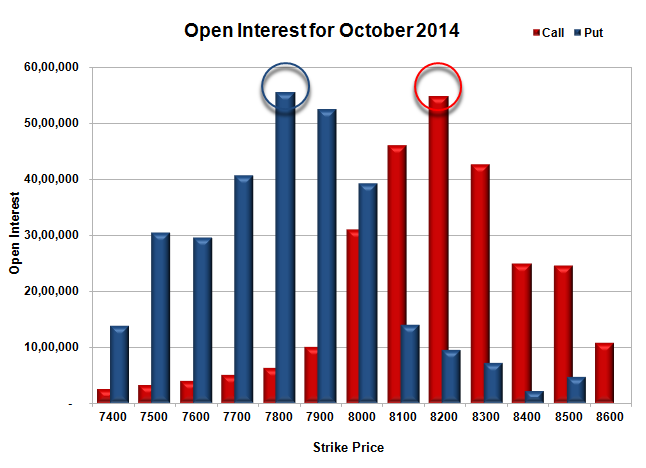 Put option 8000-7500 added huge 17.42 lacs OI with short covering seen at 8100 and above strike prices. 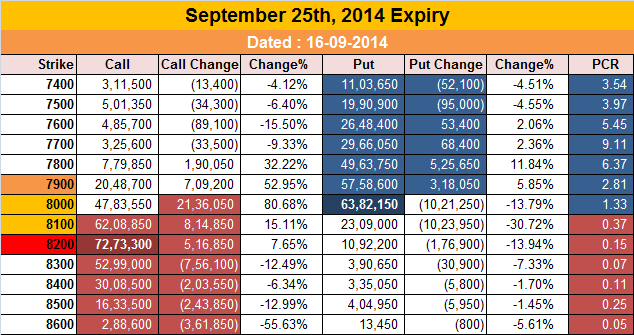 Nifty Open Interest is at 1,55,03,850 down by 9,05,850, with decrease in price, probably long liquidation. 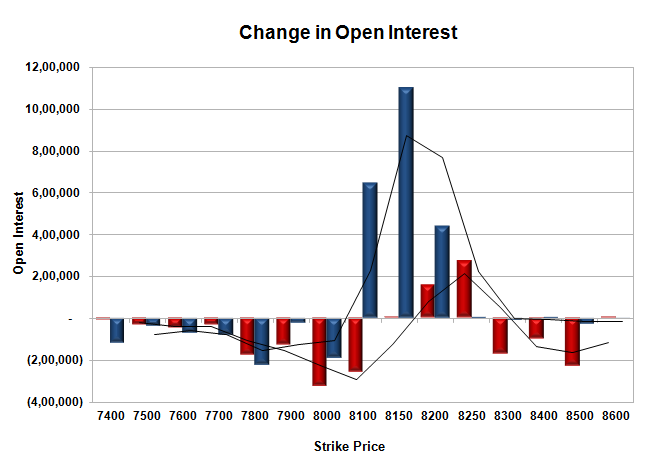 Bank Nifty Open Interest is at 15,39,950 up by 2,300, with decrease in price, probably small short build-up. FII’s bought 1.21 lacs Futures, which includes 6335 contracts long liquidation and 8759 contracts short covering, with decrease in net OI by 15094 contracts (includes 36393 longs to 33969 shorts for the day) and the average price per contract comes to around 7964.30. 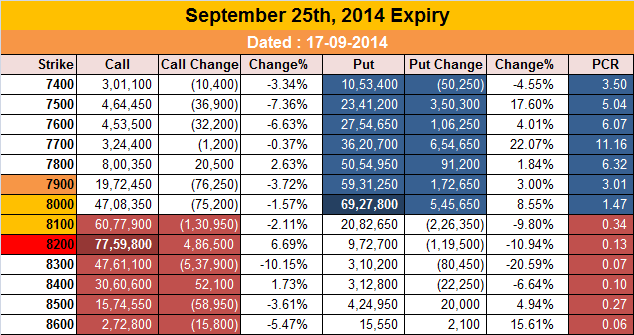 FII’s Index future open contract as on date is 204870 Longs to 61351 Shorts, net long 143519 contracts. 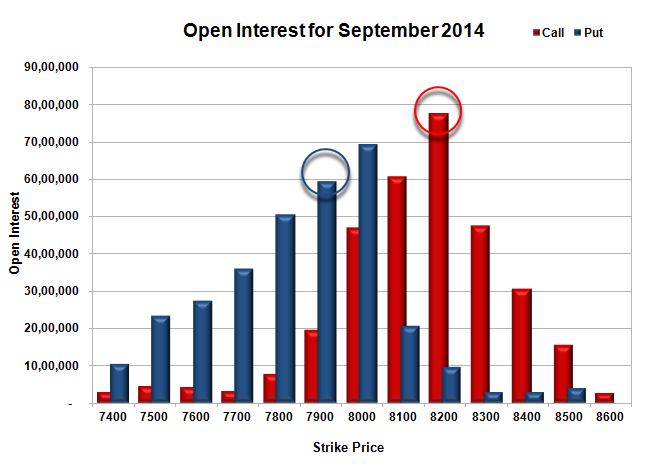 Initial support still at 7900, with OI of 38.23 lacs and below that at 7800 with highest OI of 50.97 lacs. Initial resistance at 8100, with huge OI of 43.05 lacs and above that at 8200 with huge OI of 50.80 lacs. 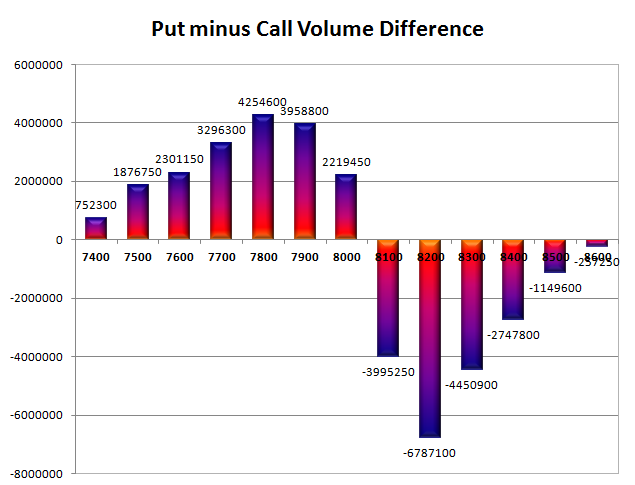 Day Range as per Option Table is 7889 - 8036 and as per VIX is 7901 - 8017 with 7962 as the Pivot. The index opened weak below 7900 and after an initial move towards 7945; the seller took control to move it towards the lows of the day around 7840. The responsive buyer came back to move the index above 7900 and close near the highs of the day at 7968.85, a huge gain of 57.00 points. The broader market was also positive, with 867 advances to 693 declines. The initial series range still remains at 7800-8200. Call option 7800-8500 added huge 36.08 lacs OI with profit booking seen at 8600 and above strike prices. 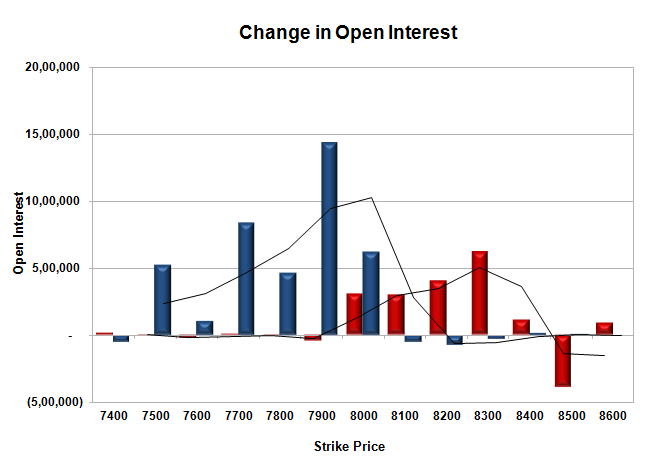 Put option 7800-7400 added huge 24.12 lacs OI with short covering seen at 8000 and above strike prices. 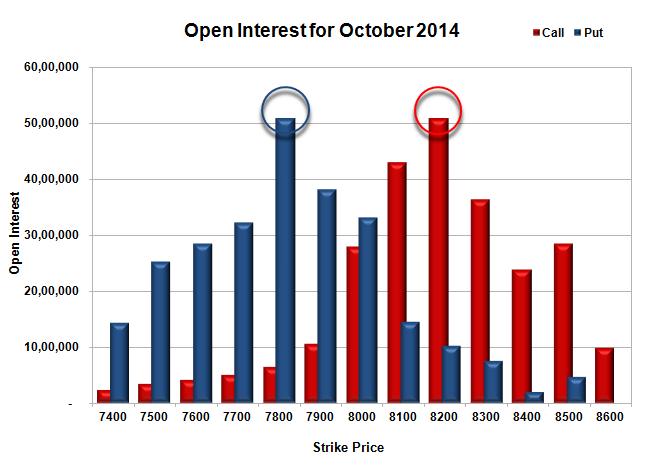 Nifty Open Interest is at 1,64,09,700 up by 6,30,800, with increase in price, probably long build-up. 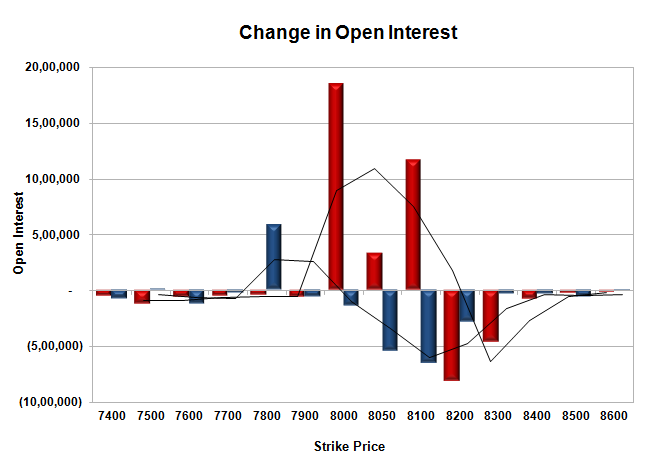 Bank Nifty Open Interest is at 15,37,650 down by 45,825, with increase in price, probably huge short covering. FII’s sold 2.69 lacs Futures, which includes 5183 contracts long liquidation and 192 contracts short addition, with decrease in net OI by 4991 contracts (includes 43734 longs to 59109 shorts for the day) and the average price per contract comes to around 8012.65. FII’s Index future open contract as on date is 211205 Longs to 70110 Shorts, net long 141095 contracts. 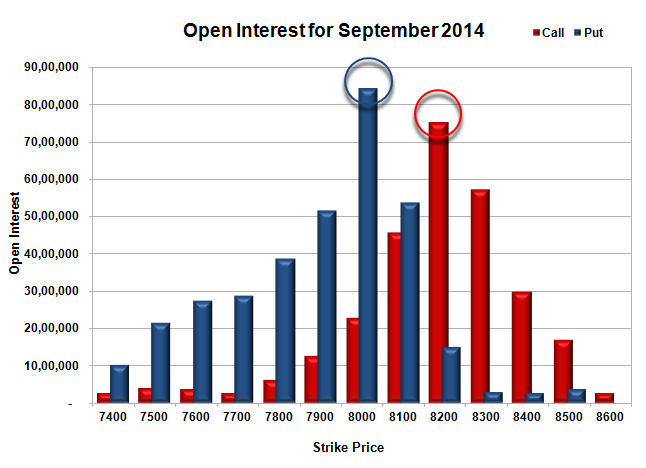 Initial support still at 7900, with OI of 37.00 lacs and below that at 7800 with huge OI of 46.06 lacs. Initial resistance at 8100, with huge OI of 36.99 lacs and above that at 8200 with highest OI of 46.15 lacs. NS Day Range as per Option Table is 7866 - 8023 and as per VIX is 7915 - 8023 with 7935 as the Pivot. The index opened flat but saw continuation of the selling pressure from yesterday to move below one psychological level after another, making a low of 7877. Short covering towards the end of the day saw the index close at 7911.85, still a huge loss of 90.55 points. The broader market was also very weak, with just 222 advances to 1355 declines. The New Series starts with a range of 7800-8200. Call option 7400-8600 added huge 55.23 lacs OI. Put option 8500-7400 added huge 56.04 lacs OI. 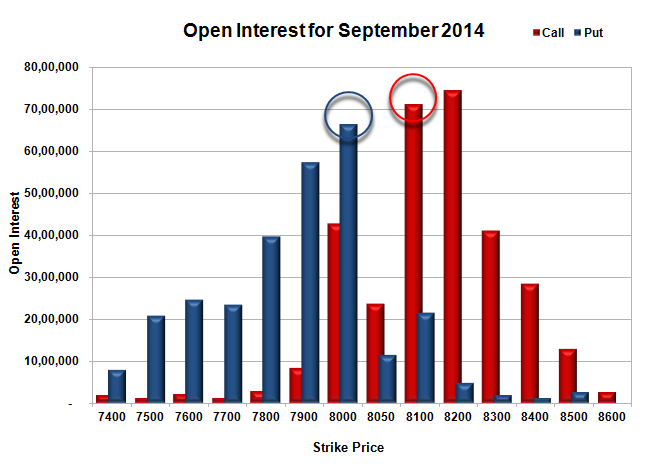 Nifty Open Interest is at 1,57,78,900 up by 34,28,650, with decrease in price, probably short build-up. 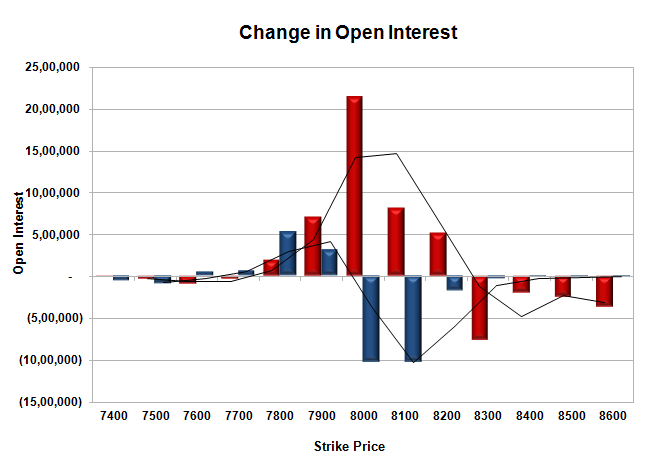 Bank Nifty Open Interest is at 15,83,475 up by 6,23,575, with decrease in price, probably huge short build-up. FII’s bought 1.59 lacs Futures, which includes 35382 contracts long liquidation and 83228 contracts short covering, with decrease in net OI by 118610 contracts (includes 133129 longs to 129958 shorts for the day) and the average price per contract comes to around 7940.11. FII’s Index future open contract as on date is 216388 Longs to 69918 Shorts, net long 146470 contracts. Initial support at 7900, with OI of 38.61 lacs and below that at 7800 with huge OI of 38.74 lacs. 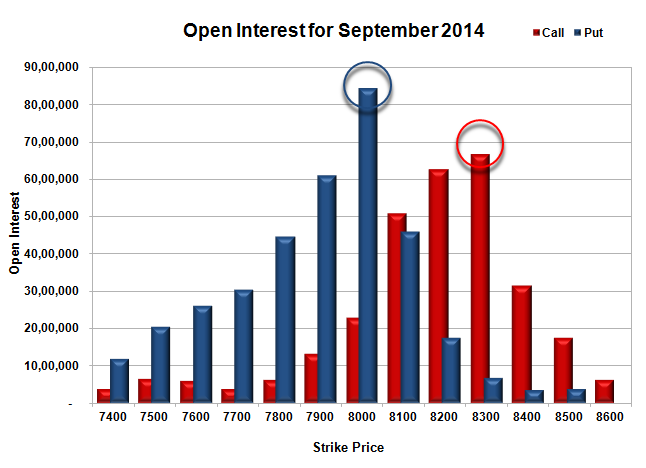 Initial resistance at 8000, with huge OI addition of 8.05 lacs and above that at 8100 with huge OI of 32.29 lacs. 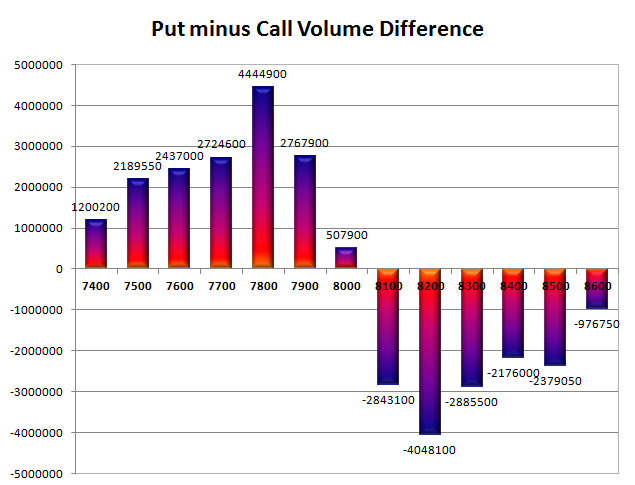 Day Range as per Option Table is 7859 - 8006 and as per VIX is 7857 - 7967 with 7936 as the Pivot. The index opened flat and after making an initial high around 8042, saw selling pressure to dip below 8000. A huge selloff during the afternoon saw the index dip towards 7950, but some value buying saw the index close just above the psychological level of 8000 at 8002.40, a small loss of 15.15 points. The broader market though was very weak, with just 381 advances to 1169 declines. The range for Expiry comes around 7940-8065. Call option 8000-8100 added huge 33.50 lacs OI with profit booking seen at 8200 and above strike prices. 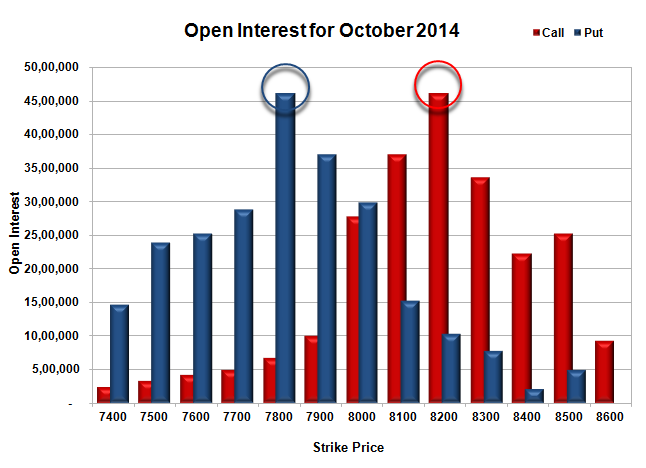 Put option 7800 added huge 5.83 lacs OI with short covering seen at 8050 and above strike prices. Nifty Open Interest is at 80,77,700 down by 20,39,150, whereas Oct series added 25.36 lacs with decrease in price, probably 100% rollover with short build-up. Bank Nifty Open Interest is at 13,12,450 down by 1,13,050, whereas Oct series added 2.60 lacs with decrease in price, probably 100% rollover with huge-huge short build-up. FII’s sold 2.08 lacs Futures, which includes 5130 contracts long build-up and 9293 contracts short build-up, with increase in net OI by 14423 contracts (includes 143482 longs to 147645 shorts for the day) and the average price per contract comes to around 8027.03. FII’s Index future open contract as on date is 251770 Longs to 153146 Shorts, net long 98624 contracts. 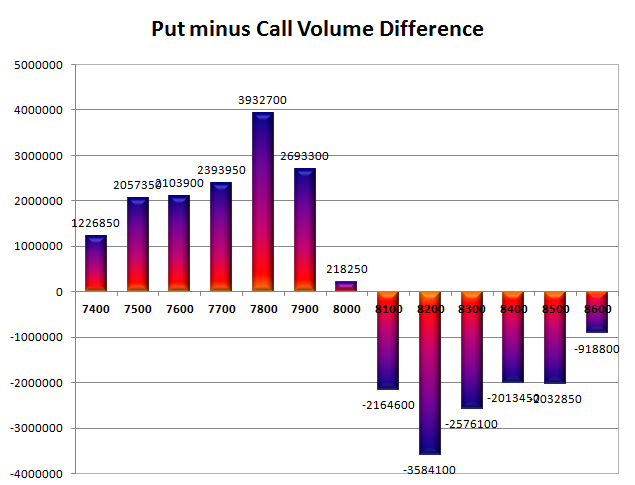 Initial and best support still at 8000, with huge OI of 66.49 lacs and below that at 7900 with huge OI of 57.26 lacs. Initial resistance at 8050, with huge OI addition of 3.37 lacs and above that at 8100 with huge OI of 71.26 lacs. 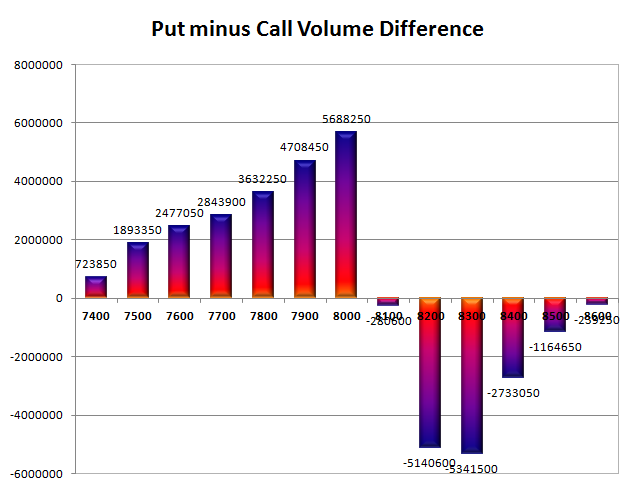 Day Range as per Option Table is 7933 - 8071 and as per VIX is 7950 - 8055 with 7998 as the Pivot. The index opened flat but saw huge selling pressure to make new lows every hour to close just above the psychological level of 8000 at 8017.55, huge loss of 128.75 points. The broader market was also very weak, with just 315 advances to 1256 declines. The range till Expiry comes around 7950-8150. 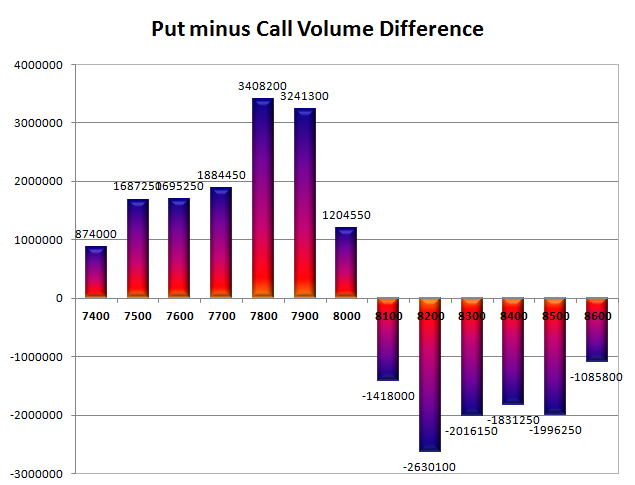 Call option 8000-8200 added huge 41.36 lacs OI with profit booking seen at 8300 and above strike prices. 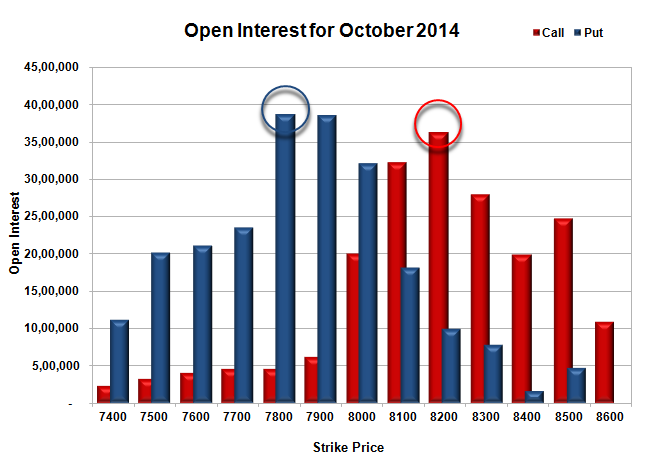 Put option 7900 added huge 6.48 lacs OI with short covering seen at 8100 and above strike prices. Nifty Open Interest is at 1,01,16,850 down by 9,73,300, whereas Oct series added 28.33 lacs with decrease in price, probably 100% rollover with huge short build-up. Bank Nifty Open Interest is at 14,25,500 down by 83,225, whereas Oct series added 1.94 lacs with decrease in price, probably 100% rollover with huge short build-up. FII’s sold 3.96 lacs Futures, which includes 17524 contracts long build-up and 25453 contracts short build-up, with increase in net OI by 42977 contracts (includes 145225 longs to 153154 shorts for the day) and the average price per contract comes to around 8046.87. FII’s Index future open contract as on date is 246640 Longs to 143853 Shorts, net long 102787 contracts. 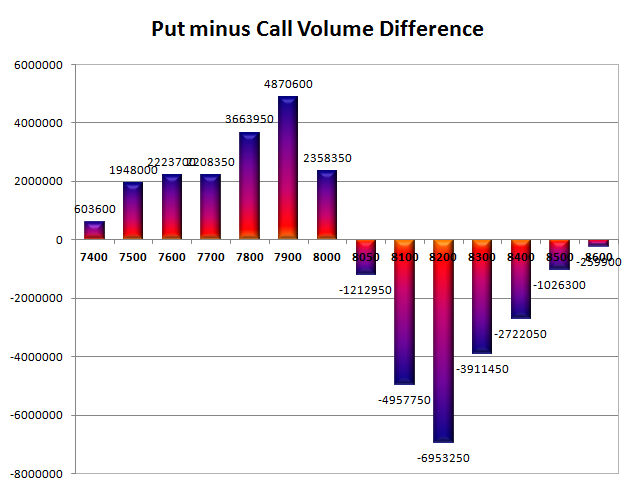 Initial and best support at 8000, with huge OI of 67.88 lacs and below that at 7900 with huge OI of 57.88 lacs. Initial resistance at 8050, with huge OI addition of 14.36 lacs and above that at 8100 with huge OI of 59.58 lacs. 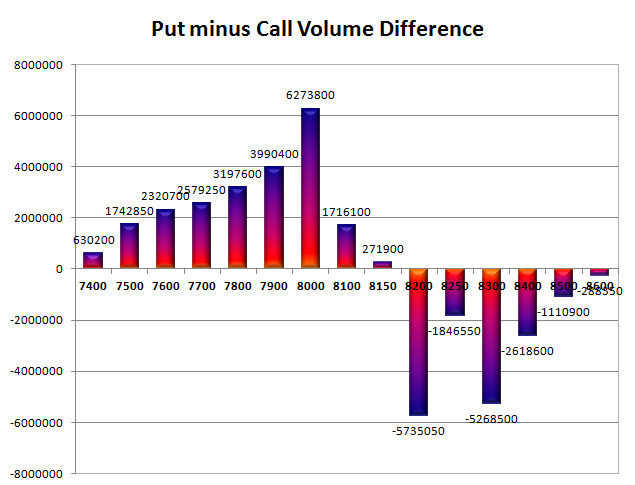 Day Range as per Option Table is 7983 - 8117 and as per VIX is 7965 - 8070 with 8062 as the Pivot. The index opened up around 8130 and stayed in a narrow range with positive bias making a high around 8160 but closing much below at 8121.45, a small gain of 6.70 points. The broader market was weak, with 706 advances to 846 declines. The range for the series is at 8000-8200. Call option 8200-8500 added huge 9.80 lacs OI with huge short covering seen at 8100 and below strike prices. Put option 8100-8000 added huge 6.40 lacs OI with profit booking seen at 7900 and below strike prices. Nifty Open Interest is at 1,27,47,600 down by 8,41,600, whereas Oct series added 6.58 lacs with no much change in price, probably rollover with long Liquidation. Bank Nifty Open Interest is at 15,71,825 down by 50,300, whereas Oct series added 0.54 lacs with small decrease in price, probably 100% rollover with small short build-up. FII’s sold 0.53 lacs Futures, which includes 2011 contracts long liquidation and 956 contracts short covering, with decrease in net OI by 2967 contracts (includes 57050 longs to 58105 shorts for the day) and the average price per contract comes to around 8129.62. 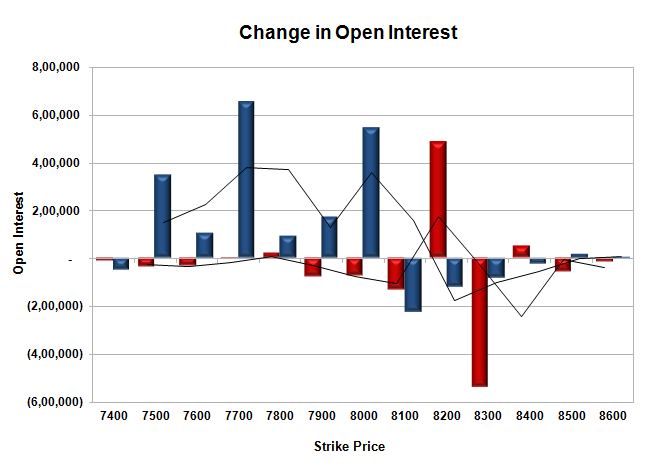 FII’s Index future open contract as on date is 184058 Longs to 76864 Shorts, net long 107194 contracts. Initial support at 8100, with huge OI of 53.81 lacs and below that at 8000 with highest OI of 84.27 lacs. 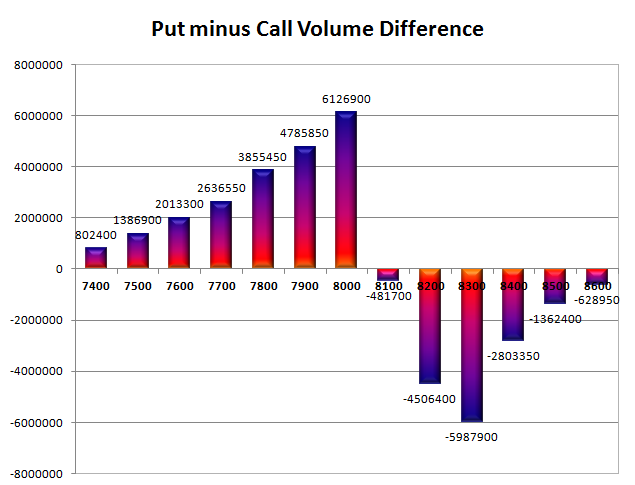 Initial and best resistance at 8200, with huge OI of 75.23 lacs and above that at 8300 with huge OI of 57.35 lacs. 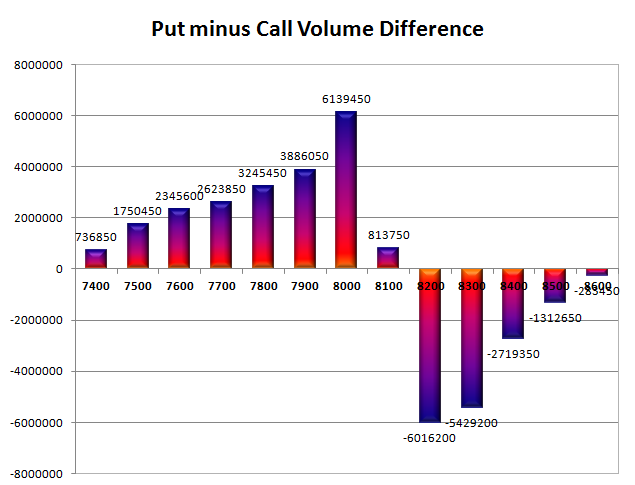 Day Range as per Option Table is 8069 - 8189 and as per VIX is 8071 - 8172 with 8129 as the Pivot. The index opened down around 7950, but saw huge buying interest within the first few minutes to scale the psychological level of 8000 with ease and went up with each passing hour to close above 8100 at 8114.75, a huge gain of 139.25 points. The broader market was also strong, with 1246 advances to 308 declines. The range for the series is back at 8000-8200. Call option 8300 added huge 9.28 lacs OI with huge short covering seen at 8100 and below strike prices. Put option 8200-7900 added huge 48.42 lacs OI with profit booking seen at 7800 and below strike prices. Nifty Open Interest is at 1,35,89,200 up by 9,53,200, whereas Oct series also added 7.68 lacs with increase in price, probably huge long build-up in both series. Bank Nifty Open Interest is at 16,22,125 down by 38,675, whereas Oct series added 0.67 lacs with huge increase in price, probably 100% rollover with long build-up. FII’s bought huge 7.94 lacs Futures, which includes 22204 contracts long build-up and 6327 contracts short build-up, with increase in net OI by 28531 contracts (includes 67653 longs to 51776 shorts for the day) and the average price per contract comes to around 8136.47. 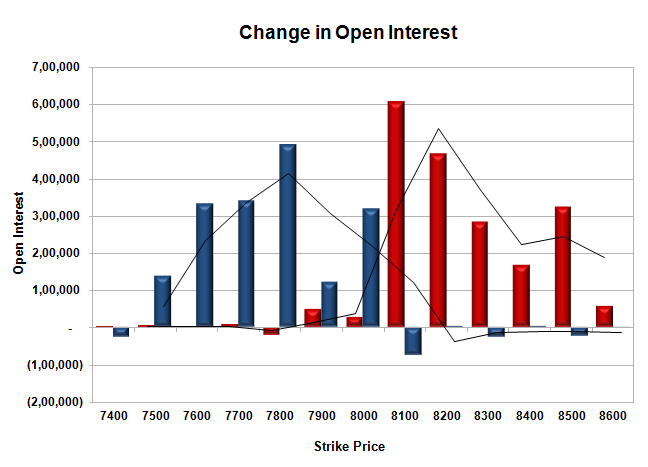 FII’s Index future open contract as on date is 186069 Longs to 77820 Shorts, net long 108249 contracts. Initial support now at 8100, with huge OI addition of 27.80 lacs for the day and below that at 8000 with highest OI of 83.06 lacs. Initial and best resistance at 8200, with huge OI of 66.99 lacs and above that at 8300 with huge OI of 56.89 lacs. 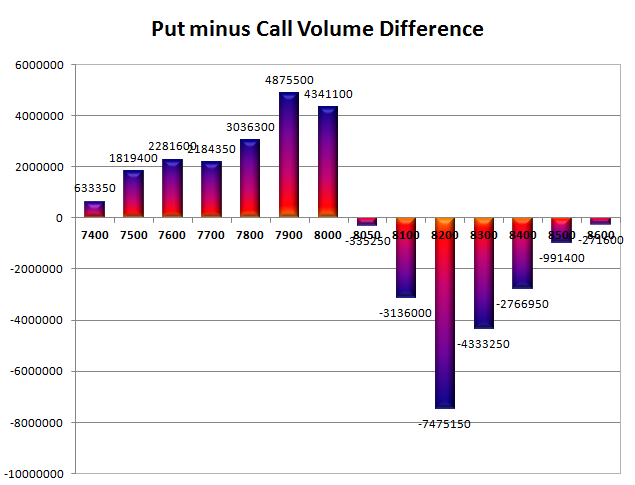 Day Range as per Option Table is 8011 - 8137 and as per VIX is 8062 - 8167 with 8058 as the Pivot. The index opened flat to lower, but saw huge selling pressure from the onset and went on to make lower lows with each passing hour. Nifty had one of the biggest loss in recent time and ultimately closed near the lows of the day at 7932.90, a huge loss 109.10 points. The broader market was also very weak, with just 226 advances to 1351 declines. The range for the series has moved down to 7900-8200. Call option 7800-8200 added huge 43.67 lacs OI with profit booking seen at 8300 and above strike prices. 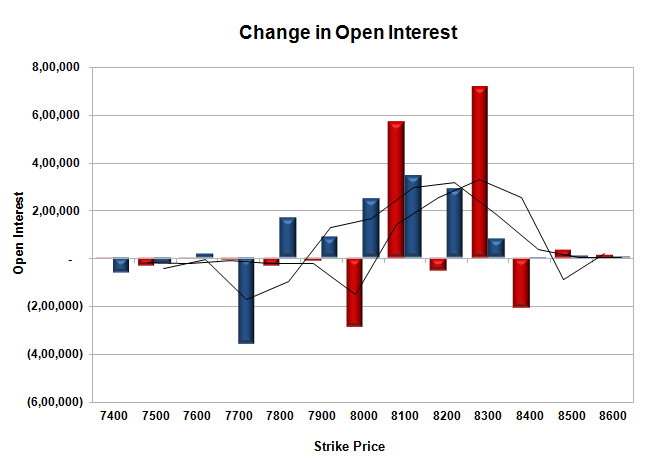 Put option 7900-7600 added 9.66 lacs OI with huge short covering seen at 8000 and above strike prices. 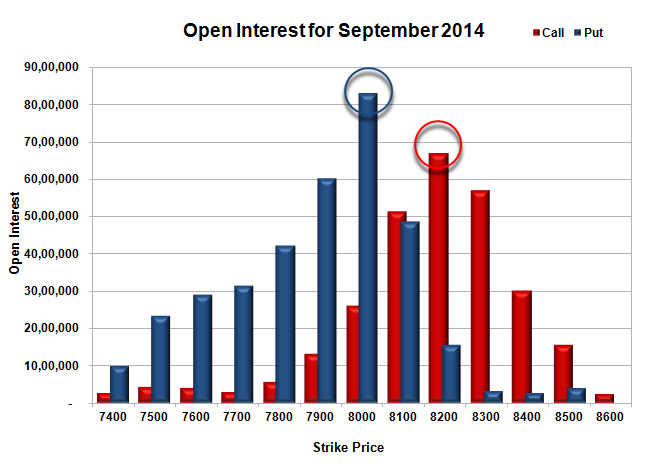 Nifty Open Interest is at 1,29,18,800 down by 5,29,000, with decrease in price, probably huge long liquidation. 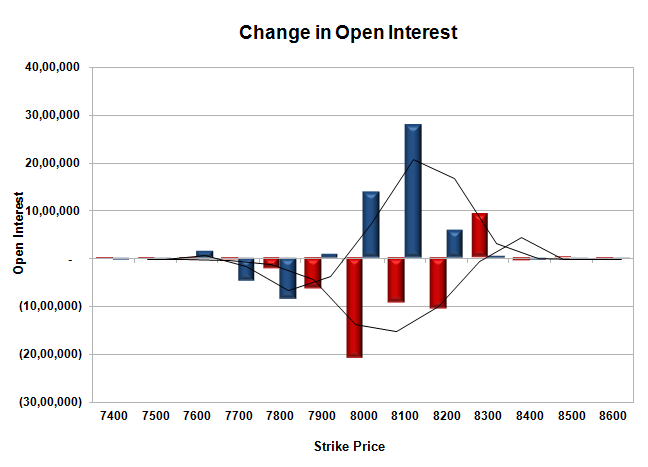 Bank Nifty Open Interest is at 17,95,675 down by 55,025, with decrease in price, probably long liquidation. FII’s sold 1.97 lacs Futures, which includes contracts 1341 long liquidation and 2608 contracts short build-up, with increase in net OI by 1267 contracts (includes 48099 longs to 52048 shorts for the day) and the average price per contract comes to around 7960.42. 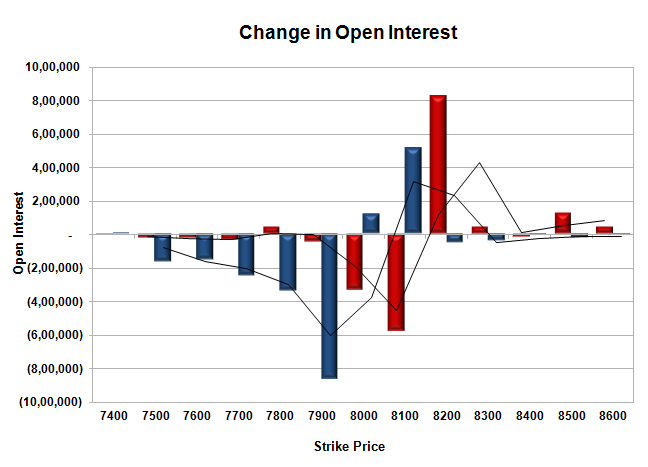 FII’s Index future open contract as on date is 169863 Longs to 78783 Shorts, net long 91080 contracts. 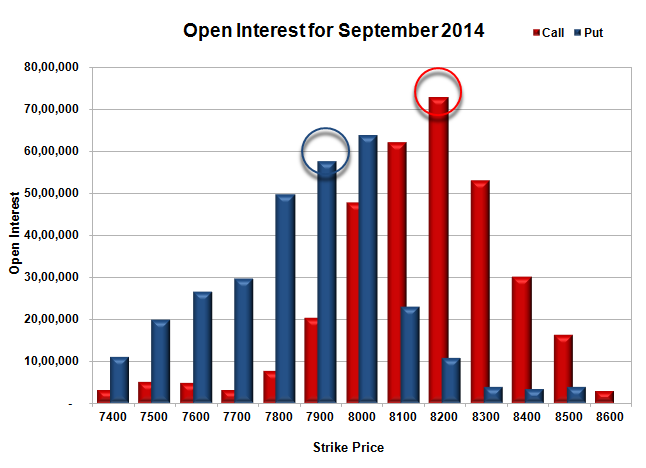 Initial support now at 7900, with huge OI of 57.59 lacs and below that at 7800 with OI of 49.64 lacs. 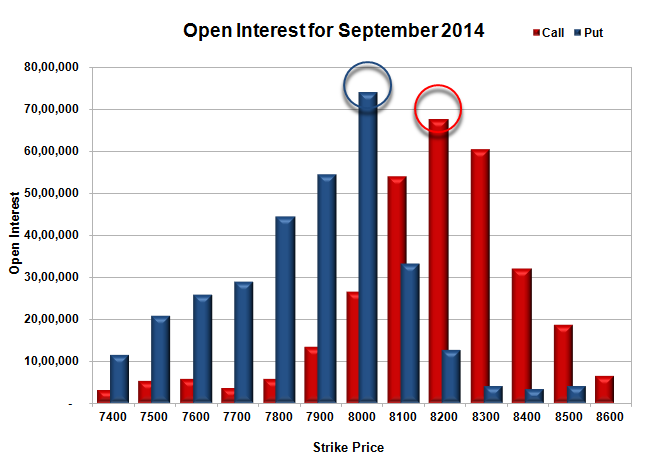 Initial resistance at 8000, with huge OI addition of 21.36 lacs and above that at 8100 with huge OI of 62.09 lacs. 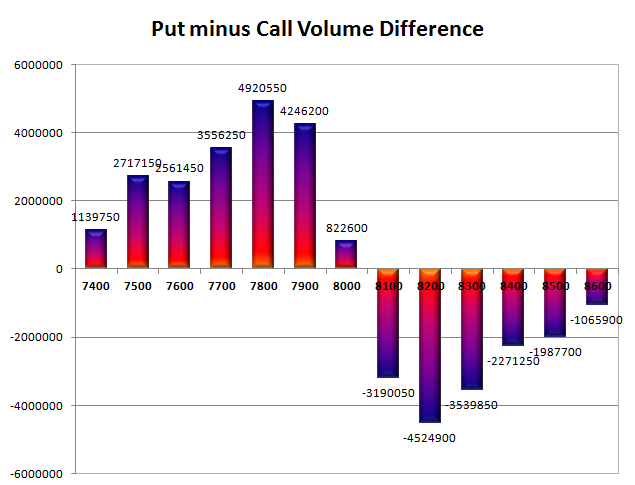 Day Range as per Option Table is 7906 - 8015 and as per VIX is 7878 - 7988 with 7968 as the Pivot. The index opened gap-down below 8100 and went on to touch the lows of the day at 8030. 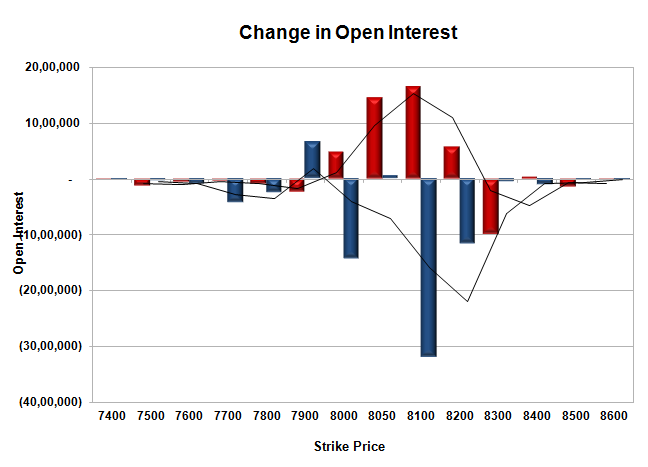 Buying interest was seen at lower levels but the index still closed in deep red at 8042.00, a huge loss 63.50 points. The broader market though was positive, with 852 advances to 731 declines. The range for the series is still at 8000-8300. Call option 8000-8200 added huge 11.52 lacs OI with profit booking seen at 8300 strike price. 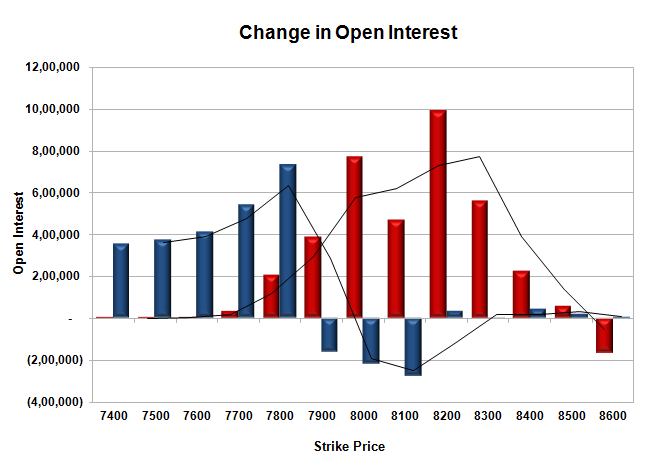 Put option did not add any OI but huge short covering was seen at 8100 and above strike prices. 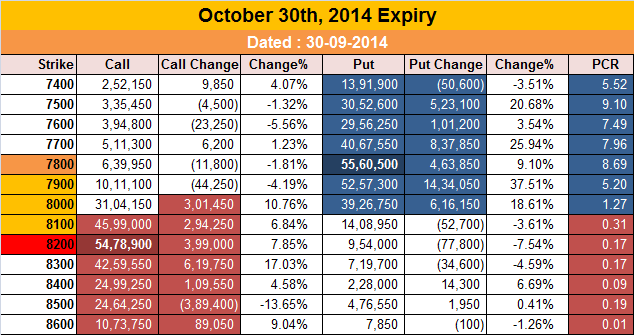 Nifty Open Interest is at 1,34,47,800 down by 2,43,750, with decrease in price, probably long liquidation. Bank Nifty Open Interest is at 18,50,700 down by 38,400, with decrease in price, probably long liquidation. FII’s sold huge 17.30 lacs Futures, which includes 13877 contracts long liquidation and 20718 contracts short build-up, with increase in net OI by 6841 contracts (includes 35660 longs to 70255 shorts for the day) and the average price per contract comes to around 8069.59. 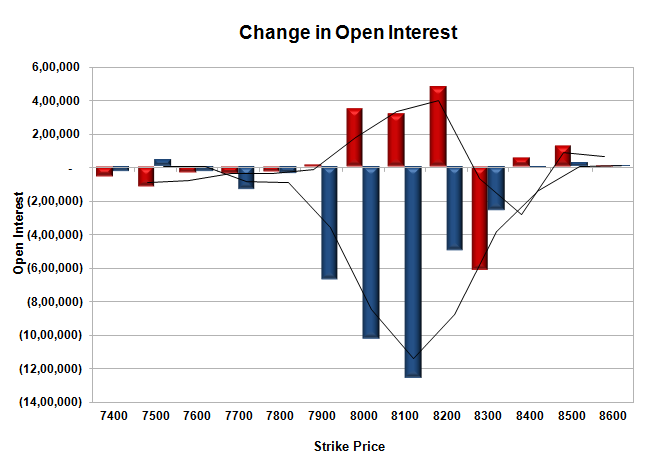 FII’s Index future open contract as on date is 171204 Longs to 76175 Shorts, net long 95029 contracts. Initial and best support at 8000, with highest OI of 74.03 lacs and below that at 7900 with OI of 54.41 lacs. Initial resistance at 8100, with OI of 53.94 lacs and above that at 8200 with huge OI of 67.56 lacs. 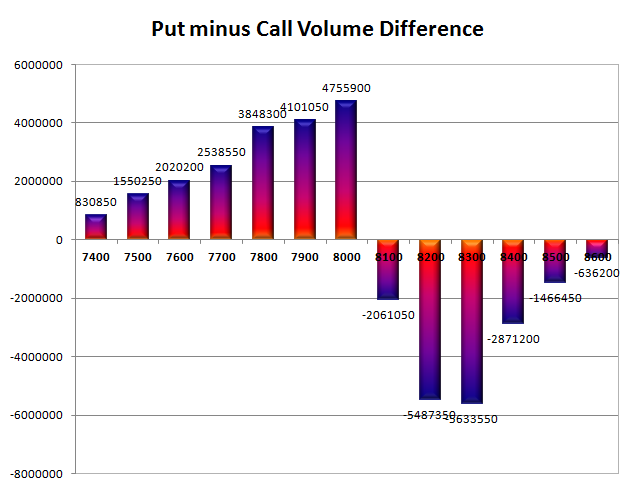 Day Range as per Option Table is 8001 - 8096 and as per VIX is 7986 - 8098 with 8050 as the Pivot. The index opened flat and went up to 8100 level, but saw selling pressure to move towards the lows of the day around 8072. The responsive buyers took control from thereon to move the index back in green and closed at 8105.50, gain of 19.80 points. The broader market was also positive, with 863 advances to 710 declines. The range for the series is still at 8000-8300. Call option 8100-8300 added huge 12.33 lacs OI with short covering seen at 8000 and below strike prices. Put option 8200-7800 added huge 11.42 lacs OI with profit booking seen at 7700 and below strike prices. 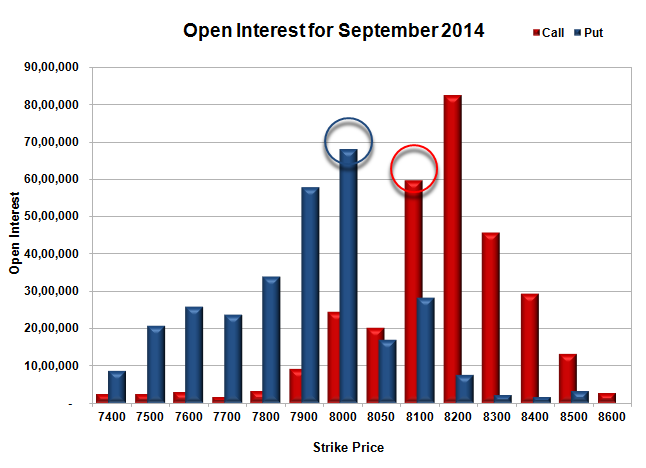 Nifty Open Interest is at 1,36,91,550 down by 2,34,900, with increase in price, probably short covering. 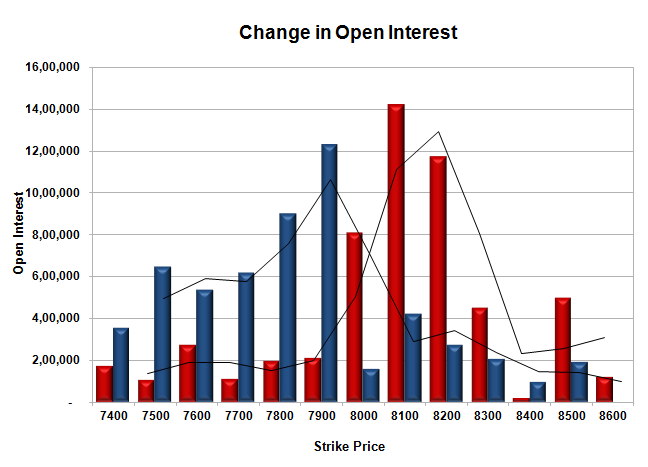 Bank Nifty Open Interest is at 18,89,100 up by 2,450, with increase in price, probably small long build-up. FII’s sold huge 6.12 lacs Futures, which includes 8712 contracts long liquidation and 3523 contracts short build-up, with decrease in net OI by 5189 contracts (includes 24483 longs to 36718 shorts for the day) and the average price per contract comes to around 8140.70. FII’s Index future open contract as on date is 185081 Longs to just 55457 Shorts, net long 129624 contracts. Initial support at 8100, with OI of 45.91 lacs and below that at 8000 with highest OI of 84.26 lacs. Initial and good resistance at 8200, with OI of 62.75 lacs and above that at 8300 with huge OI of 66.68 lacs. Day Range as per Option Table is 8051 - 8145 and as per VIX is 8053 - 8158 with 8097 as the Pivot.